Can’t do pull-ups? Elastic bands won’t leave your lat development hanging. Previous story Max Mind Set: How Your Subconscious Impacts Your Fitness Aspirations Next story Are You Man Enough For Yoga? Common training wisdom entails thinking of elastic bands strictly as implements that increase the degree of difficulty of the exercises with which you’re incorporating them. It’s possible, however, to reverse this process and set up your bands to give you some help with movements you’re still learning how to do. If you’re having trouble with pull-ups, the following progression will have you banging out sets of 10 in record time. With pull-ups, most people have difficulty at the very bottom of the movement, in the dead-hang position. Using bands as a springboard from this static start position will allow you to more easily initiate a full-range pull-up, while still forcing you to finish the exercise on your own as the assistive effect of the bands lessens toward the top of the movement. 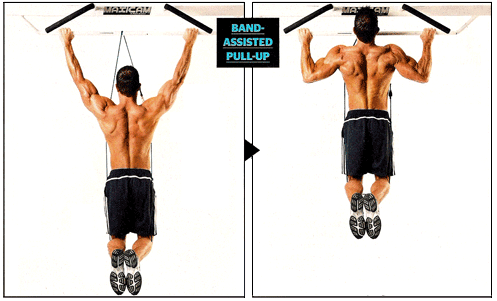 The most effective way to perform band-assisted pull-ups is from the overhead bar in a power rack. String a strong elastic band horizontally across the middle of the rack, at approximately chest level, by attaching it to the rack’s spotter bars. Stand so the band is behind you, band one knee in “quad stretch” fashion so the top of your foot sits on the band, then grasp the bar in an overhand grip with your hands at shoulder width. Since the spotter bars in a power rack are easily adjustable, move your band setup down one notch each week. The higher the band sits, the more help it’s going to give you, so the idea is to give yourself progressively less resistance until you’re eventually able to do your pull-ups without external aid. For most people, pull-ups are a “to failure” exercise that can be performed relatively frequently. Work this progression in as your primary lat exercise on back day, then throw in an extra pull-up session at the end of your lower body workouts. Try for sets of 10 with at least a minute’s rest between sets. Band-Assisted Pull-ups 3 10 60 sec. Barbell Bent-Over Row 3 8-10 60 sec. Seated Cable Row 3 12 60 sec.